Winter is almost done and was not only late, but a rather ill-mannered no-show in my garden this year. 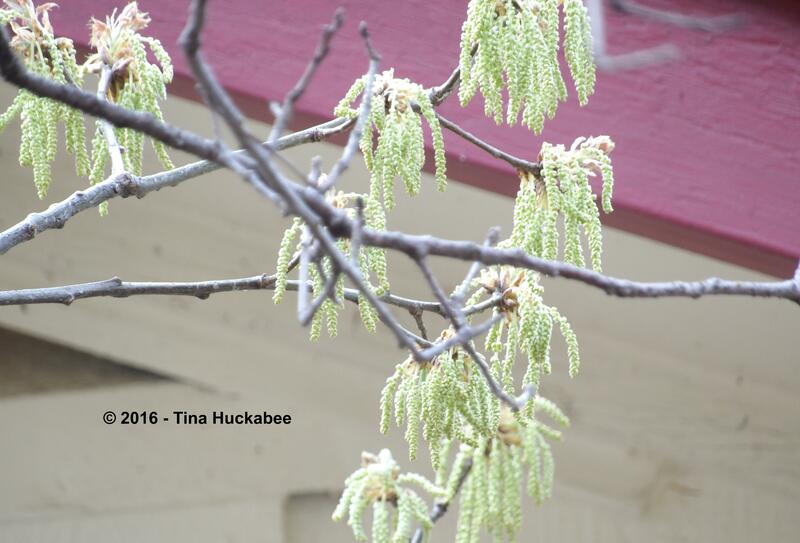 Here in Central Texas, the trees are flowering and leafing out with abandon, seemingly racing one another to full-fledged foliage. Even so, the only plants that are weirdly early in my gardens are the Shumard Oaks–they don’t normally flush new growth until the very end of February or beginning of March. But like an excellent and welcomed dinner guest, the Golden Groundsel, Packera obovata, is right on time in preparation for its flower show. 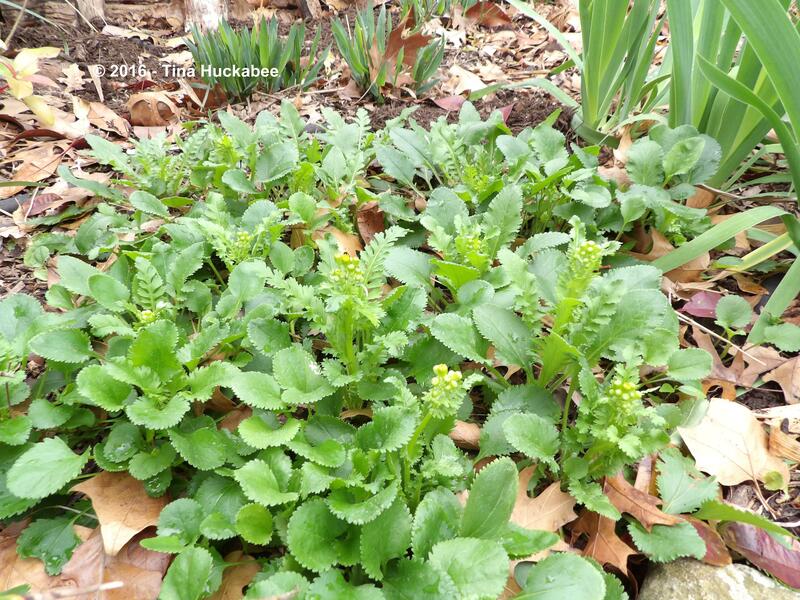 One of our earliest bloomers, the bloom stalks have arisen and will brighten this shady area in the next few weeks. 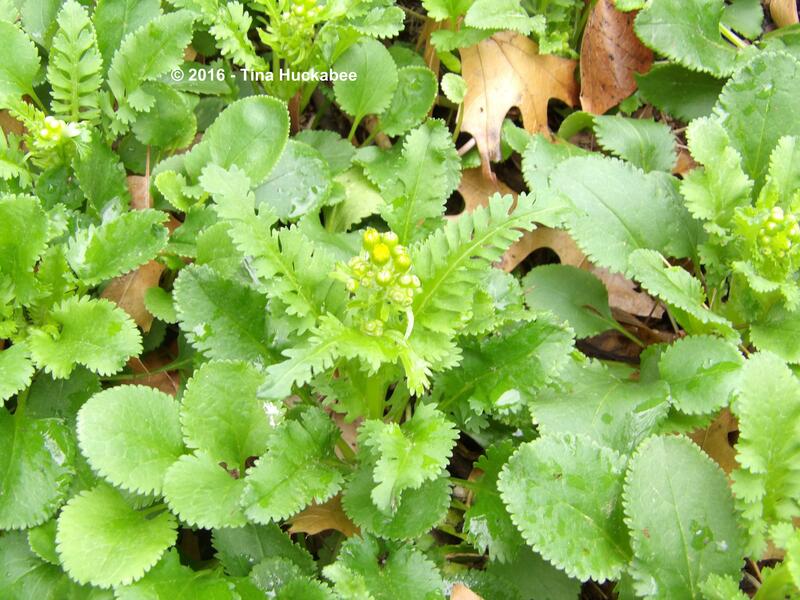 …the foliage of this tidy, woodland wildflower is what I find most appealing about this North American beauty. Evergreen and ever-lush, the plant forms a colony of finely serrated, ovate leaves and those make up the “staple” foliage of the plant, year round. A sprinkling of rain in the last 24 hours is the only rain for the past month. 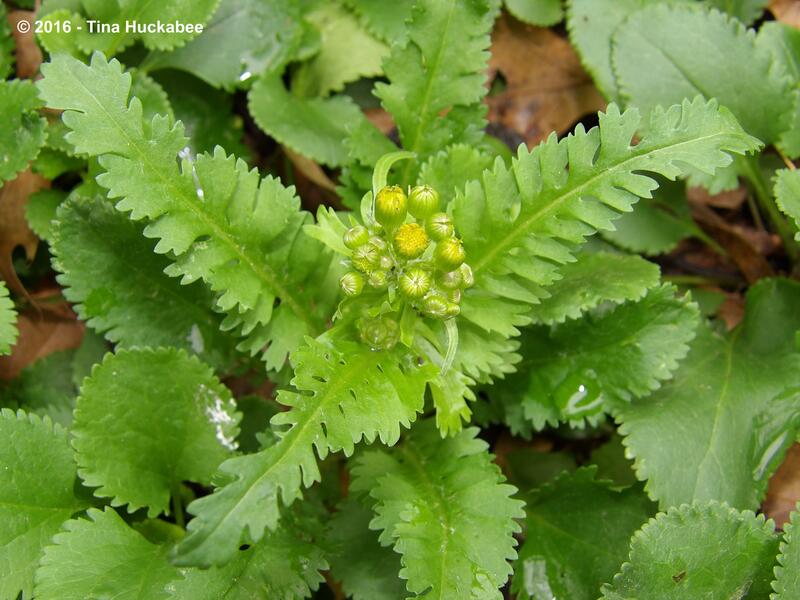 As the plant prepares for flowering, the foliage connected to the bloom pedicels develops a more fern-like, deeply serrated character. The two-fer foliage quality of this wildflower is captivating. …and a handsome ground-cover throughout the year. Perhaps the blooms will be up and running in time for Garden Bloggers’ Bloom Day in March! 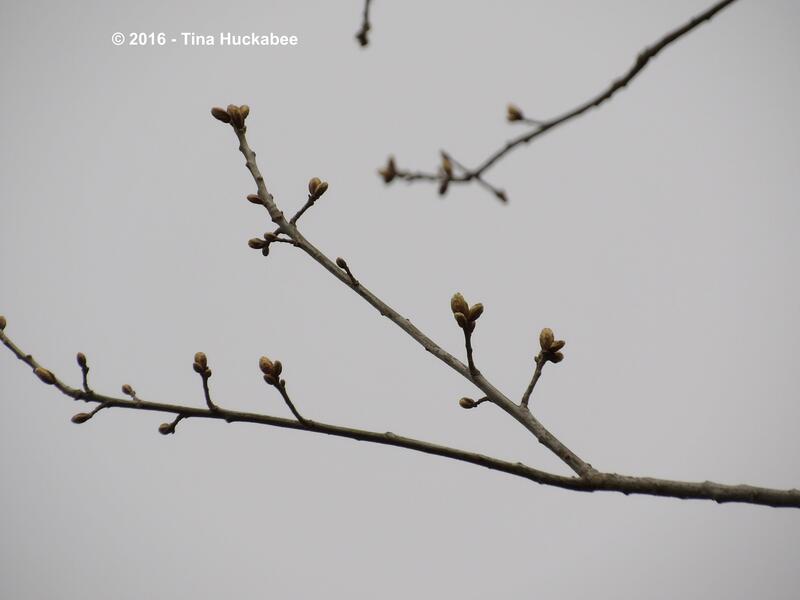 In celebration of February foliage, thanks to Christina’s lovely Creating my own garden of the Hesperides. 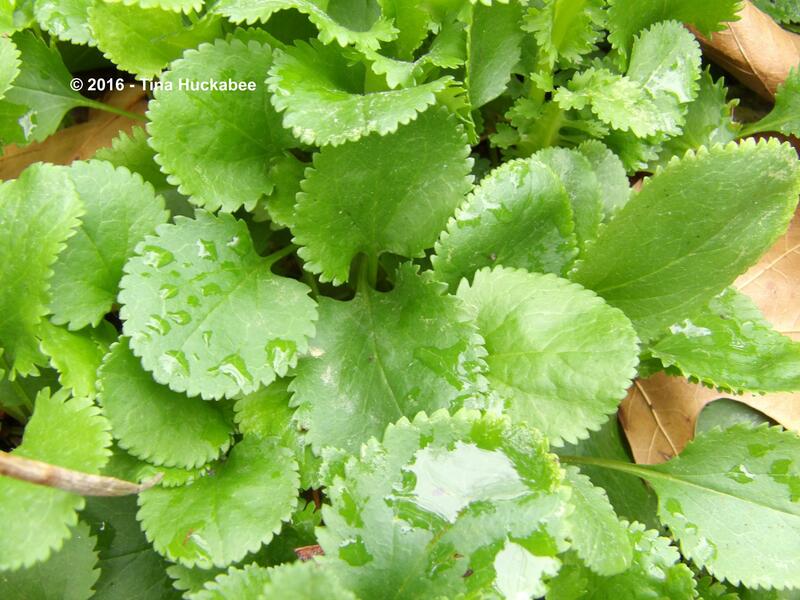 Check out her Garden Bloggers’ Foliage Day meme for a look at foliage from many gardens. 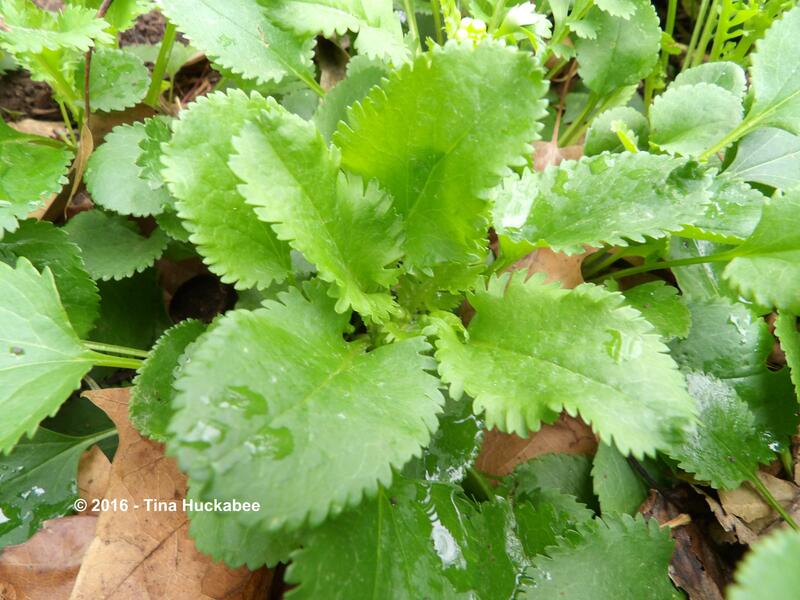 This entry was posted in Golden Groundsel, Packera obovata, Uncategorized and tagged Garden Bloggers' Foliage Day, GBFD by Tina. Bookmark the permalink. Packera obovata, is a real beauty, maybe it is something I could grow here. Does it tolerate cold, if the soil is free draining? Thanks for joining GBFD this month Tina. Yes to both of your questions! My soil is rather clayey and the Golden Groundsel has grown just fine, spreading slowly over the years. My climate is probably similar to yours–hot-n-dry for the summers, wetter in winter, though I’ll bet we’re not quite as cold as you are. 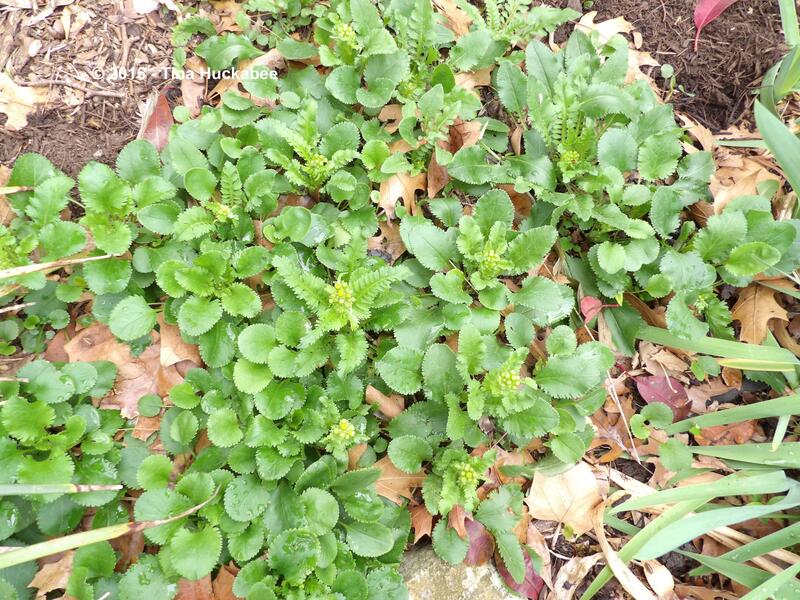 This is a native to a large area of North America, so I don’t know whether it would be invasive where you are–probably not–but let me know if you grow it and how it does for you. Thanks for that. Clay would make your soil moister than mine. Also, this plant has a wide range in North America and lives in much colder climates than mine, so I imagine it would do well for you. Let me know! It’s so pretty and such a nice addition to the early spring garden. 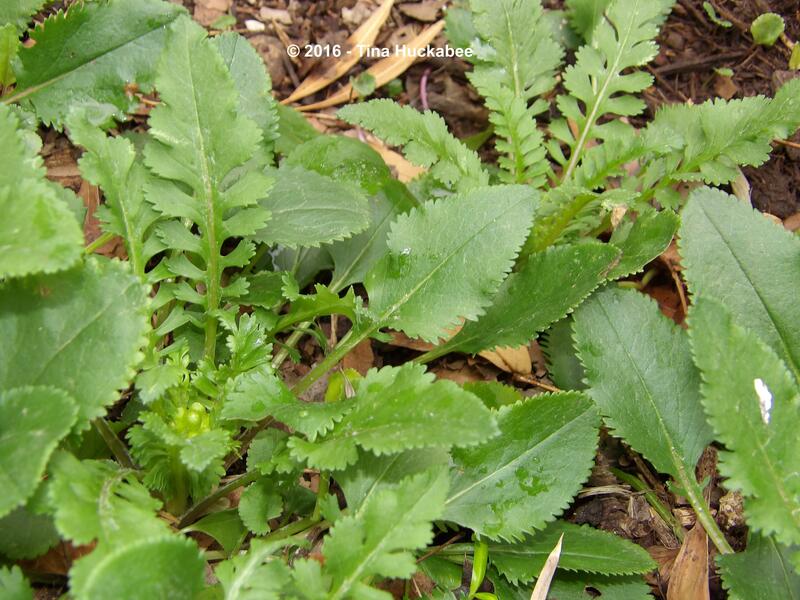 I’ve had Golden Groundsel on my list for a while and hope to add it one day. I think I need to find it at a plant sale that specializes in native plants. Shirley, I think I bought mine at BSN, but the WC has it on their spring plant sale list most years–if you’re in Austin for that. Good luck with your search. Your golden groundsel is a really lovely plant Tina, I like the expression two-fer, the double whammy of foliage is a winner and the flowers lovely too. Thanks, Julie–I really like it quite a bit. Ha–I don’t know where that expression comes from (two-fer); I guess I should look it up. 🙂 It’s a lovely plant, all around–“double whammy” is a good description, too! Oh, yes, it does appear it will be blooming nicely for the next GBBD! It looks so fresh and optimistic. The blooms and the foliage are wonderful! That’s a great description, Beth: fresh and optimistic. It’s a very spring-y plant, I would agree with that. I find the two different leaf shapes fascinating and the tiny flowers so cheerful. I imagine I would smile each time I looked at this plant in bloom. This is one I’ll keep in mind for the shady spots. It’s definitely a plant that brings on a smile, Tracy. 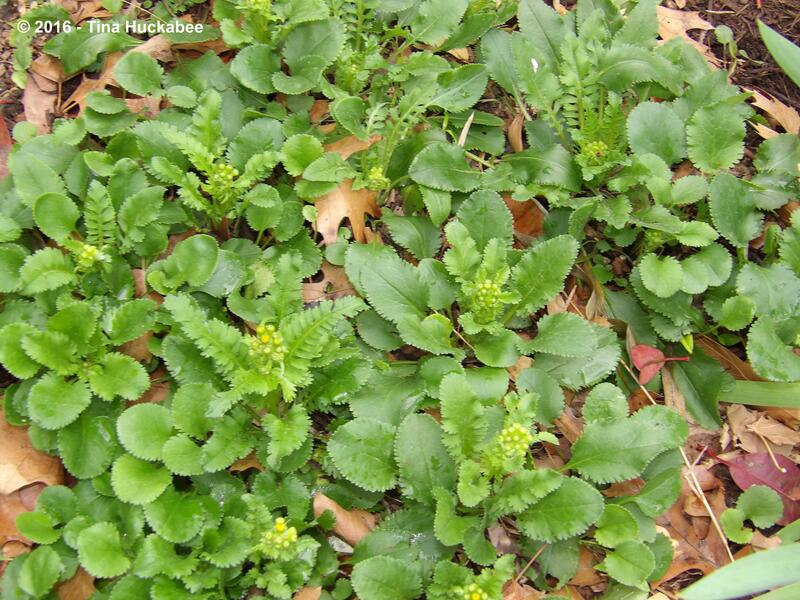 Golden Groundsel is a terrific, shade-tolerant perennial. 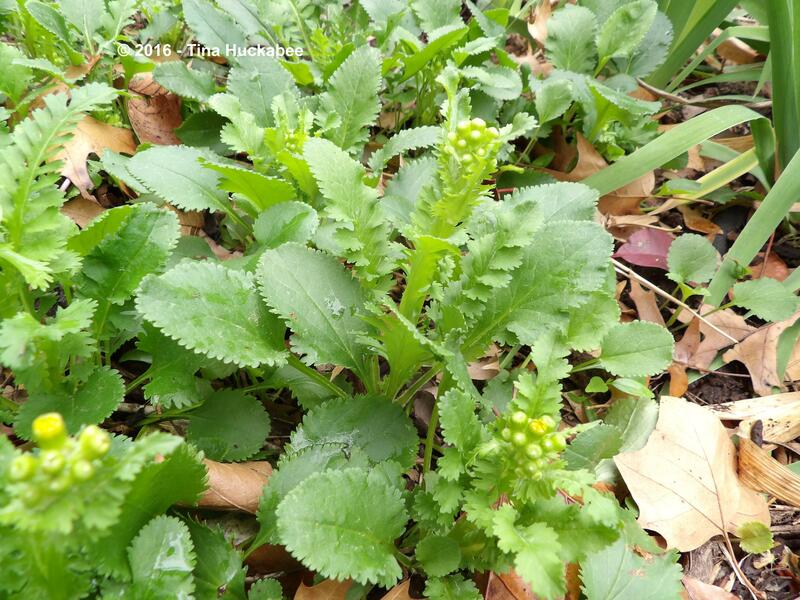 I’d been excited, thinking I had some Golden Groundsel appearing in an unmulched bed, but it turns out it was yellow blooming dandelion variants, a weed by most standards, and not the two-staged native I’d hoped for. The leaves are roughly similar, but the flowers not nearly so prominent. Close….but no cigar! Now that I have this post for reference, I doubt I’ll be tricked so easily again, but I’m such a sucker for yellow flowers appearing on almost any sort of rosette. So cheery and bright in those shady corners. I’m keeping an eye out for it now at my favorite nursery. I’m not putting in m/any new plants due to the rough weather we’re having, but tried and true natives are always welcome here! 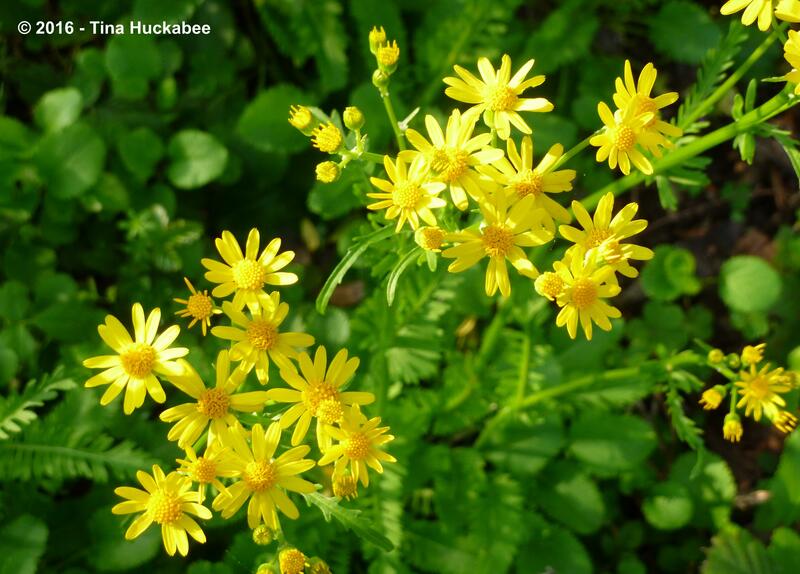 Let’s see: yellow blooms and puffy, wind-borne seeds–might be Golden Groundsel or dandies! 🙂 I’ve never had my GGs seed out successfully, despite allowing them to go to seed each year. I don’t know if it’s the mulch in my gardens or if maybe the wind really does carry the seeds elsewhere, though in my ‘hood that would mean their getting mowed as soon as they’re established. If you can find a four inch or larger pot, you’ll be in GG business, though–I hope that happens, because these are something to really look forward to.